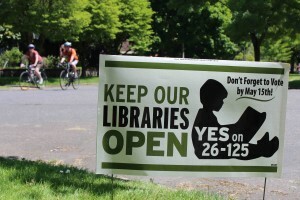 The Multnomah County library ballot initiative provided an opportunity to launch a crowdsourced social media campaign that leveraged place-based networks — social networks that aggregate user visits and reviews of physical locations, such as Yelp or Foursquare — to raise awareness and build community around the library system. Think about that for a minute. A city of less than one million has a circulation that is second only to a city with over eight times the population. That’s c-r-a-z-y. Not surprisingly, the levy — which renewed a rate of $.89 per $1,000 of assessed property value for three more years — passed with over 80% of the vote last Tuesday. Good thing too, as the Multnomah County Library is facing an $11 million shortfall. To many Portlanders — a city with a high concentration of digirati — their library system is a source of immense pride and they are ready to flock to social media platforms to express their love. “It’s a jewel,” says communications consultant Pam Kahl, who joined the Libraries Yes Campaign to support the online engagement. According to Kahl, the day that Portlanders were invited to review their libraries on Yelp, the response was so overwhelming that Yelp headquarters assumed it was spam. One of the beauties of “Heart Your Library” is that it worked in a concentrated period of a few months leading up to the May 15 election, but has long-term engagement possibilities as well. “It has a long tail,” said Lennan. To start, it allows the library system to identify its key supporters and nurture that network. In addition, it provides a platform where library fans use their own words and experiences to tell the library’s story, the “holy grail for campaigns,” according to Lennan. As the chart to the right demonstrates, over the course of seven weeks there was a steep increase in cumulative IDs and outreach contacts. An outreach contact represents an individual that was directly contacted by a campaign organizer. An ID represents a library supporter that responded to this outreach and took action to support the libraries: by uploading a photo on the campaign’s Pinterest page, volunteering, or tweeting to name just three examples. Now that the levy was successfully renewed, the next step is continuing to harness the momentum of the campaign. “We want to move users from social to a conversation,” said Lennan. So go ahead, show your library a little love.